The month of December had it’s fair share of crazy. The winter holidays typically slow down development in just about any company. Fortunately, for us that time off allowed us more time to sink into the game. We also took the lulls to reflect on the current state of the game and our core systems. This month we were also invited to the Whippering Indie Cup in San Francisco. This was our first indie meet-up we’ve ever attended. We didn’t show our game but we did get to meet with a number of indie developers and there games. Hearing about their stories, struggles, and what motivates them was inspiring and reassuring. Knowing that we aren’t alone was a great feeling as development can be a very isolating experience. 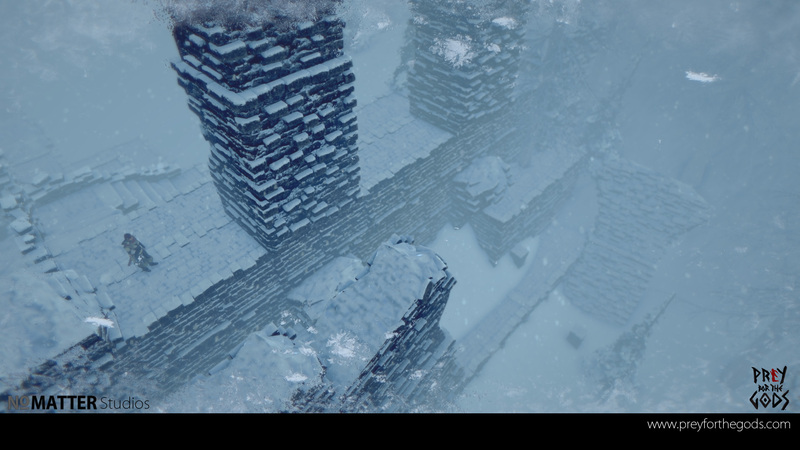 One of the new features we have been hard at work on is our Dynamic Weather system in Praey for the Gods. The world in Praey for the Gods is a treacherous and ever changing environment where you never know quite what to expect from a sunny day, to a blizzard at a moment’s notice. The weather system controls the amount of snowfall, velocity of the wind, density of the fog and the amount of cloud cover. All of these variables change over time in semi random ways to create unique weather for each time you play the game. 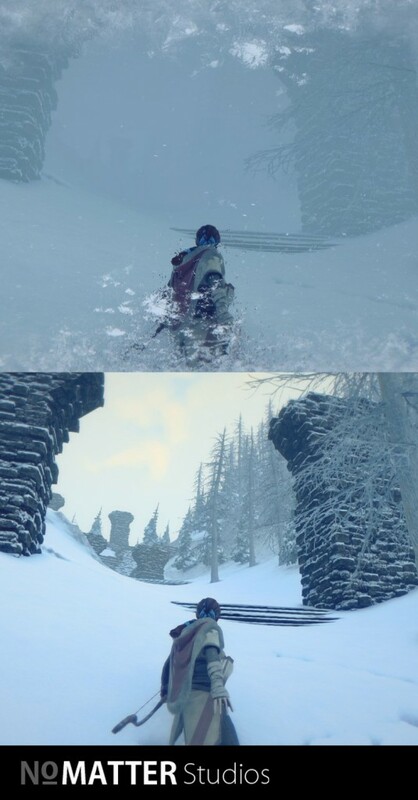 The weather not only provides a visual change of environment but also affects the player, for example try to stay out for too long during a blizzard and you risk getting cold from exposure. 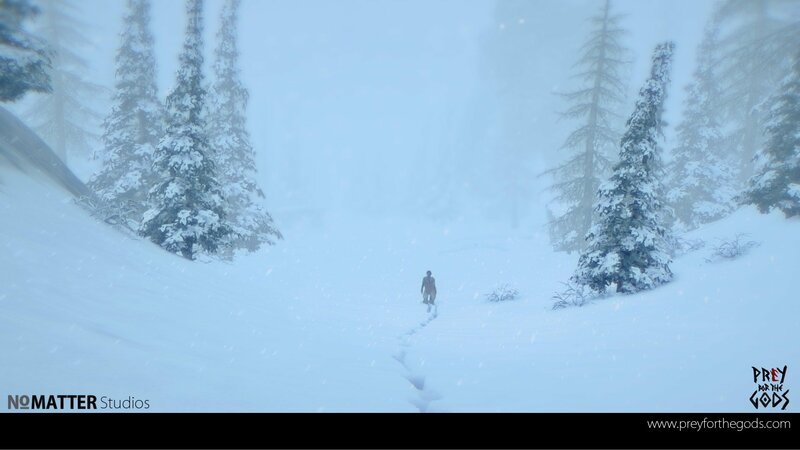 Extreme weather will force the player to make a decision of trying to continue to find a boss despite the cold, or change course and look for shelter from the storm to warm up. Visibility also changes quite a bit depending on the weather. While the sun is out and the visibility is high the player will find it easy to navigate the environment to find where they need to go but try and stay out during a blizzard and risk getting lost and maybe even dying from exposure/cold. With the weather system in Praey for the Gods, the environment becomes just as dangerous as the giants you are after. Being the last of 2015 we’ve seen our game come up on players “best of” and “top 10/20” lists. That is huge! To see and hear this from fans keeps us pushing through the tougher days of development and working into the early hours. We also thought well what were our favorite games of 2015 and what were the games that we’re watching for 2016? – Fallout 4: So much to explore and find, I end up having to pull myself away from the game as hours will fly by. – Besiege: So much fun building crazy contraptions. The missions become secondary to trying out an idea I have in my head for a siege engine. – Captain Forever Remix: A lot of fun figuring out what ship designs work best and seeing how far you can make it. – Far Cry 4: Just a really solid game all around. – No Man’s Sky: I can’t wait to see how this game comes together. I’m intrigued by the massive scale and procedurally generated planets. – XCom 2: Loved the last XCom, just waiting for more. – Deus Ex: Mankind Divided: I’ve always been a big fan of Deus Ex, more of this is a good thing. – Mirror’s Edge Catalyst: Love the art style of this game also the fast paced parkour gameplay. – Firewatch: I’ve watched a bunch of videos on this game. I’m still wondering what shockers are in store when you play it. – Bloodborne: Super hard, cool monster and boss. – Captain Forever Remix: Option to build your own ship and blow up other ships. – Tom Clancy’s The Division: Online RPG shooting with friends. – No Man’s Sky: Universe to discover!! – Dark Souls 3: I like the pain. – The Last Guardian: maybe 2016?? – Super Mario Maker: Seriously, too much fun. – Shovel Knight: Plague of Shadows: Finally, beat Shovel Knight and now more? – Metal Gear Solid V: Great game and I’m still playing it! – Titan Souls: I beat it!! Do you know how hard that is to do?! – Deus Ex: Mankind Divided: Deus Ex is my favorite game of all time. HR was great too. – Zelda: I’m a sucker for anything Zelda. – Little Devil Inside: I backed this on Kickstarter. The trailer pulled me in and am looking forward to seeing more. – Arena Gods: Small indie game by 2 devs. Tim and I played this at the indie cup I haven’t had this much fun in so long. I was screaming and jumping up and down as the combat and gameplay is that fun! – VR GAMES…seriously some of the stuff that’s going to come out will blow minds. We have some important announcements we’ll be sharing this next month. We think fans of PFTG will be very happy to hear about them as they’ll definitely help with development.Thanks so much for your support! We plan to make 2016 a big year for Prey for the Gods! We’ve done some more interviews and we’re doing our best to respond to as many as we can. They certainly take time and we do our best to answer them thoughtfully. Over the coming months, once they are out we’ll link to them below.